HellKid: Hook & Jump is a Sonic the Hedgehog-ish side-scrolling game for the iPhone and iPod Touch. Though challenging and full of great art, the by-the-book platforming and uninspired level design will likely keep this game in a hellish state of obscurity. The little devil not only walks in the valley of the shadow of death, but enjoys doing jumps there as well. The main character, a little devil named Devi, is interested in becoming human and he believes that he can achieve this feat by collecting a bunch of human souls in Hell. His plan underway, Devi approaches a creepy-looking older devil that warns him to cease his interest in humans. Ominous! Our little HellKid (much smaller than Hellboy) then sets out across the burnt landscape of the underworld doing exactly what his wise elder devils told him not to do. The gameplay is very elementary: HellKid runs all by himself, so all you need to do is tap once to make him jump and tap again and hold to make him reach out and grab things with his Stretch Armstrong-like limbs. In Hell, the only things you need to jump over are ravines and the only things you can grab onto are giant pillars. The game designers at StudioUFO never meant for HellKid to challenge you mentally, but as the main character increases his speed through the levels, the game does challenge your finger reflexes. The main skill that this game will test is your reaction time, so a screen touch just a millisecond too late can send you cascading down a ravine. Falling becomes frustrating because a little mistake forces you to start all over again. Later in the game, you can unlock a round which allows you to start at a faster speed, but the repetitive rounds to get there can get a bit wearisome. Hellkid sticks to the simple bread and butter of platforming gameplay. There are two types of souls to collect: red fire and blue fire. 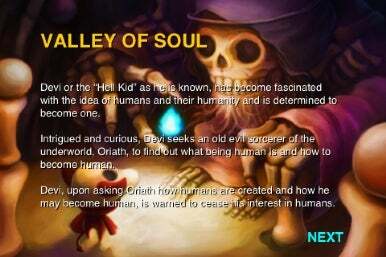 There are two modes of play: “Valley of Souls” which gradually speeds up with increasing levels, and “Valley of Despair” which offers unlimited play. HellKid only runs and jumps. Maybe this is why he wants to become human. The only things that break up the monotony are the beautiful artwork and design. As Hell’s ravines, towers and souls steadily stream across your screen, the background holds an awe-inspiring view of cascading volcanoes and ominous flying black birds. 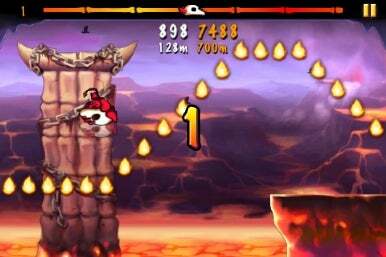 Despite the overall repetitiveness, HellKid actually offers an adequately fun experience that is reminiscient of the challenge Facebook users got from Jetman for years. Like Jetman, Hellkid hopes to capitalize on the competitive spirit and allows for players to post their high scores for the world to see. Offering automatic or manual high-score posts to an in-game scoreboard, Twitter and Facebook, you no longer will have to sit at the local arcade for 10 hours straight to be a hometown hero. If you play this for too long, will you strain your finger? Probably. Is this app enjoyable enough to be worth $0.99? Probably. Will you delete it in two weeks if it doesn’t catch on with all your friends? Probably.